Benjamin Franklin said, "Early to bed and early to rise makes a man healthy, wealthy and wise." While he may have been correct (generally speaking); I would suggest that healthy, wealthy and wise may not be the best case scenario for those who claim to follow Christ. Of course the alternative is to be sickly, poor and foolish. That doesn't sound great either. 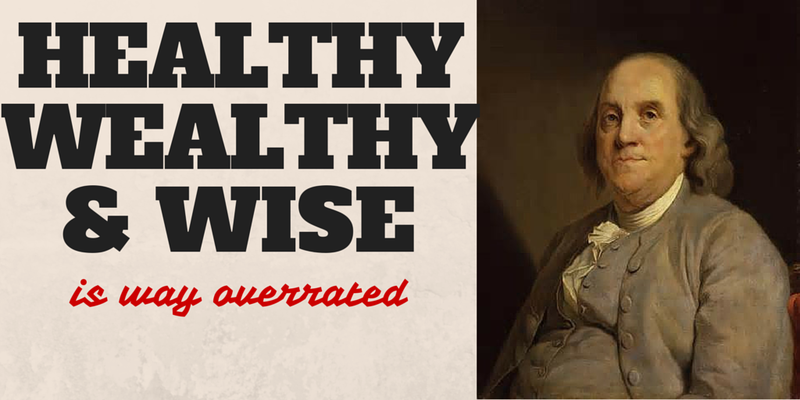 So why would I suggest you might not want to be healthy, wealthy and wise? The American way has always been to pull oneself up by ones bootstraps (an impossibility, practically speaking). As a "founding father", Benjamen Franklin certainly helped to shape this piece of our social makeup. While there is much good to be considered in the ethic of hard work and self-determinism, there is also a great danger in assuming that we can somehow be the masters of our own fate. Hard work and a disciplined life will reap benefits. Those benefits will often last you your entire life on earth. That is good. But will your efforts profit you in eternity? John wrote to the church in Laodicea, "You say, ‘I am rich; I have acquired wealth and do not need a thing.’ But you do not realize that you are wretched, pitiful, poor, blind and naked." Jesus said to his followers and the Pharisees, "It is not the healthy who need a doctor, but the sick. I have not come to call the righteous, but sinners." The more convinced we are that we have it "all together", the less we will find room in our lives for Christ. The more we believe that we are healthy, wealthy and wise, the less we will consider our need for a spiritual father, physician or savior. The more we think of ourselves, the less we'll think of Him. I hope your life is not difficult. I hope you do well and reap the results of your efforts. I hope you live long and free from pain or disease. I hope you keep learning and understand much. And I hope you always recognize that you don't have what you need. Jesus said, "Here I am! I stand at the door and knock. If anyone hears my voice and opens the door, I will come in and eat with that person, and they with me." I hope you are never so content with the life you have made, that you don't allow Him to make a far better life for you.